There’s not much left to say about this dish. I’ve described it pretty thoroughly in the posts for Cilantro Walnut Filling and the Sour Cream Pastry Dough . Those two recipes are the main ingredients for the final Beef Wellington recipe. 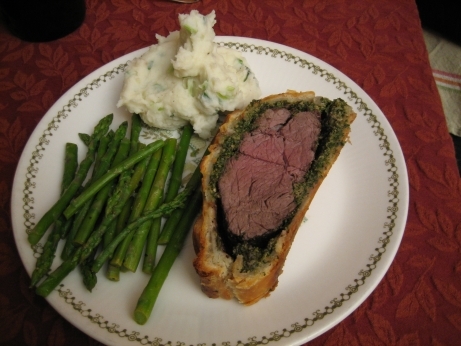 A nice big beef tenderloin seasoned with salt and pepper is thoroughly browned, covered in the cilantro walnut filling, and then wrapped up in the sour cream pastry dough. The dough is decorated with cut out bits of pastry, given an egg wash, then the whole thing is baked. As I said in their respective posts, the dough was a real winner, while the filling was just OK on it’s own, and very out of place in a beef wellington. I mildly overcooked the tenderloin but it was still excellent. Filet mignion and a perfectly baked crust were more than enough to make up for the filling. The final dish was tasty, but I really missed the mushroom of the traditional Wellington. I could live without the big slice of pâté though. Beef tenderloin can be a real hit to the wallet, at higher end butcher shops a whole tenderloin sells for close to $100, which is really not in line with my financial reality. I managed to find a commercial cut tenderloin (PSMO) for one third the price. It was good quality meat (not organic, local, or in any way fancy, but perfectly nice), but it required a little bit of work on my part. A commercial cut tenderloin comes with a good deal of silver skin to be removed, as well as an extra little side muscle best used for something else. I can’t say that peeling off silver skin is much fun, but it’s absolutely worth doing for the price difference. This updated beef Wellington didn’t really improve on the original, and other than having beef in a pastry had very little in common with beef Wellington. The pastry and beef were top notch, while the filling was somewhat lacking. I would use this recipe again, but I’d go back to a more traditional filling. I don’t regret making it, but I’m not itching to have the twenty-first century version again. This link takes you to the BEST Beef Wellington recipe ever.